The Chrysler Building is, according to many, the most beautiful skyscraper in New York, even though there is a minority that calls it kitsch. 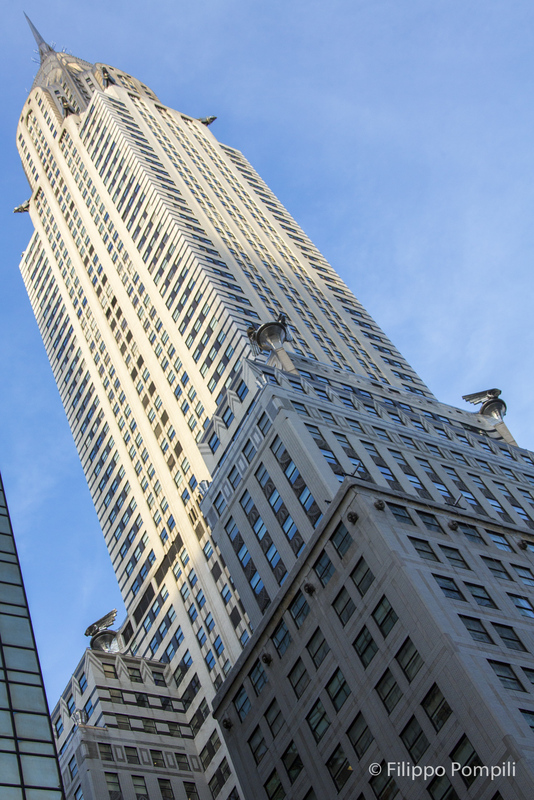 Designed by William Van Alen and completed on May 27, 1930, its 319 meters made it the tallest building in the world, although only for nine months when it was passedby the Empire State Building. It follows the Art Deco style and has as its main feature a particular spire that recalls, at the behest of its owner Walter Chrysler, founder of the Chrysler automotive industry, the radiator of a car. This point was kept secret during construction as at the same time they were building the Bank of Manhattan Trust Building on Wall Street, a skyscraper that competed with the Chrysler to be the tallest in the world. At the corners of the fortieth floor were also inserted four large metal sculptures that reproduced the caps of the radiators of Chrysler cars and higher at the base of the spire eight heads of eagles protrude outwards. The building was one of the first in which, among other things, metal was used as the covering material for the external walls. The inner atrium is decorated with African marble walls and the ceiling is covered by a large painting. The artist who designed it, Edward Trumbell, used as models some of the workers who built the building. In the early years the atrium was used as an exhibition area for Chrysler's cars and until 1945 there was a panoramic observatory open to the public on the 71st floor. Today it is only possible to visit the atrium.